What were the conditions that preceded and triggered the behaviour? Did the person behaving, gain any form of benefit as a result of his/her behaviour? If he/she did gain a benefit, what was it? Let us investigate the interesting world of "behaviour modification". What is the definition of behaviour modification? Behaviour modification is a system of planned interventions, which are designed to interrupt a current "problematic behaviour" and cause it to change to a more "desirable behaviour" (ie the target behaviour). Antecedent: Refers to the conditions that preceded the behaviour. The antecedent asks the question, "What was going-on in the environment prior to the behaviour?" Behaviour: Refers to the specific action, that the person did or said. The behaviour asks the question, "What exactly did this person actually do?" or "When placed in a certain set of conditions, how do people behave?" Consequence: Refers to the new conditions that immediately follow the behaviour. The consequent asks, "What changes occurred in the conditions, as a consequence of the behaviour? and, "How did those changes affect the person behaving? The most interesting question is: after the behaviour, did the person behaving gain anything? Let us make an underlying assumption explicit: the assumption is "Everything happens for a reason." The cause of the behaviour is the Antecedent. The purpose of the behaviour is the Consequence. Here is a fact of human nature: Everyone wants the current situation to give them what they want. Therefore if, in any set of circumstances, a person performs an action (a behaviour), that results in them gaining an immediate benefit, then that behaviour is more likely to occur. (The benefit must be regarded from the behaver's personal perspective, not your benefit, nor "for the Good of the Many"). What were the conditions that triggered the behaviour? What happened to the person behaving after the behaviour; did they gain a benefit, (measured from the perspective of the person behaving)? If they did gain a benefit, what was it? Imagine an 8-year-old child who always misbehaves whenever he is in the supermarket, food shopping with his parent. The child constantly cries, pulls, shouts, and stamps his feet. The parent, in an attempt to mollify the child, buys him a bar of chocolate. When asked why he gave the child chocolate, the parent said, "Because I needed to calm him down and to shut him up". Ultimately, what do you think the parent is training the child to do and to believe? The parent is accidentally training the child to misbehave, because the chocolate POSITIVELY reinforces the child's BAD behaviour. If you were wise, you would never positively reinforce a negative behaviour. In addition, the parent is inadvertently training the child to believe that "bad behaviour pays dividends". 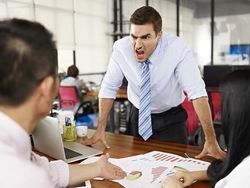 Example two: If a person at work speaks harshly and swears at his manager and, as a result, the manager relents and gives the aggressor what he wants, just to shut him up and get rid of the problem behaviour, then ultimately, what is the manager training the person to do? It is the Perceived Consequences of a behaviour that determine whether it will be repeated. (The consequences must be viewed from the perspective of the person behaving, not from the perspective of onlookers, or considerations of what constitutes The General Good). If a person behaves in a particular way, and does so repeatedly, then we can assume they perceive that the behaviour is producing some kind of beneficial consequence. (From their perspective, not yours, nor anyone else's). As long as the person continues to receive a perceived benefit for behaving in a certain way, that behaviour will continue. They think the behaviour will lead to a dis-benefit, or painful consequence. To repeat, the detrimental consequence must be considered from the perspective of the person behaving, not you, nor the greater good. If you want to modify a behaviour, then the first thing to do is to analyse the immediate consequences, that happen to the person behaving. If your analysis shows the person behaving is receiving an immediate benefit, of any kind, then that behaviour is likely to reoccur. If you want to change that behaviour, then you must remove its beneficial consequences. If your analysis shows the person is not receiving any dis-benefit for a bad behaviour, then you should ensure that either no benefit should follow a bad behaviour, ie No positive reinforcement. Or "painful consequences" should always follow a bad behaviour. Negative reinforcement. If you change the consequences, then you will change the behaviour. If you have a bad habit, such as eating too much (or eating too little), then ask yourself the following questions? What immediate benefits does your subconscious mind believe you are gaining from engaging in this "unwanted behaviour"? How can you arrange things in your head so that the unwanted behaviour is associated to either: no benefit or painful consequences? How can arrange things in your head so that you begin to attach more benefits to an alternative corrective behaviour? Many people believe in the concept of a 'reasonable excuse'. This is a misconception, since reasons are very different from excuses. We examine the differences between excuses and reasons and show you how you should treat them both. Improving your people management skills will help you to make more progress towards your goals. At home too, your happiness is directly related to how much cooperation you can get from your family. Managing people correctly is an important skill for every successful manager. Many people step into the role of manager without any formal training, and will need to be taught good people management skills. Do you realise that when you reward bad behaviour you are positively reinforcing that negative behaviour? Consequently, this will encourage that person to behave in that way again.